Don’t you hate books on how to write by professors who get to enjoy year after year of the attention of an ever-changing parade of young faces, upturned to receive their wisdom like flowers drinking rain? Envy aside, my reaction to Beth Kephart’s Handling the Truth was a touch… tetchy. Memoir is a strut and a confession, a whisper in the ear, a scream. Memoir performs, then cedes. It is the work of thieves. It is a seduction and a sleight of hand, and the world won’t rise above it. Or you won’t. I don’t exactly know what Kephart means by that, but I enjoyed reading it. 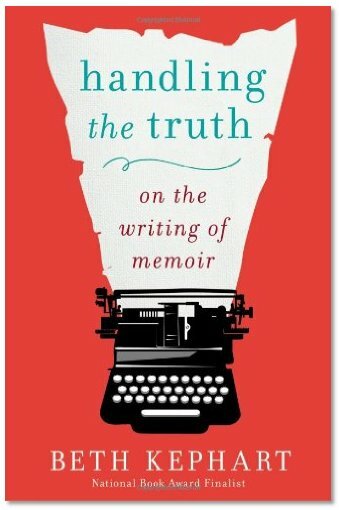 As an author of five memoirs and a teacher of college-level memoir classes, Kephart brings plenty of chops to the task of writing yet ANOTHER book on how to write. One strength and differentiator of this book is the many excerpts from published memoirs it brings together. In an excellent appendix titled “Read. Please.” Kephart doesn’t just list a bibliography but describes what she likes about each. This book would be worth owning just for the recommended reading list. I could definitely see spending a week in a cabin somewhere with Handling the Truth and a blank notebook. Maybe the reason I’m a little tetchy about this book is that I don’t have the liberty to do that right now. Note to self… make time to write!